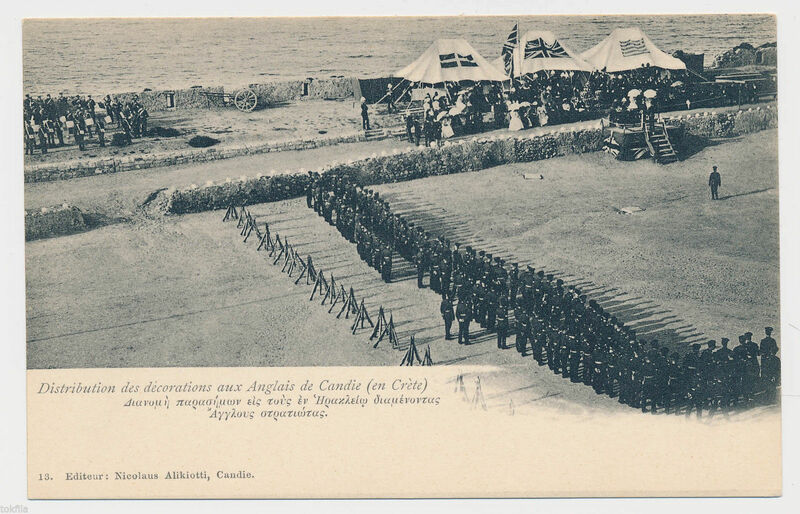 August | 2014 | The British in Crete, 1896 to 1913. 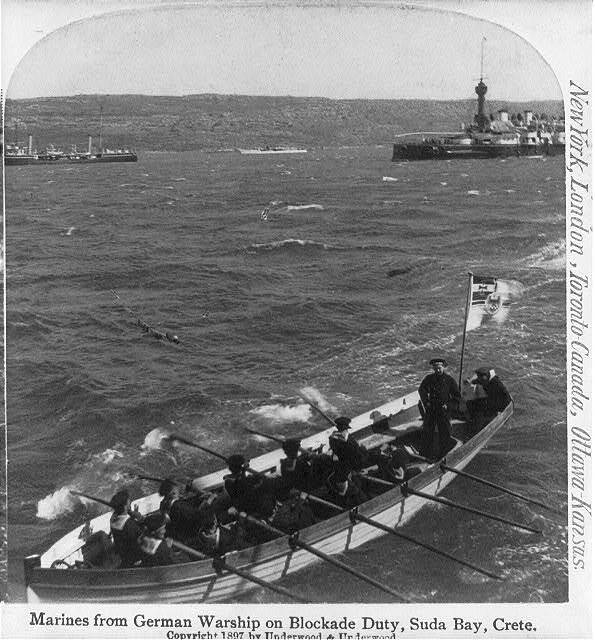 Amongst the first troops sent to Crete were the 1st Battalion, the Seaforth Highlanders sent from their station on Malta to Crete in April 1897. In this depiction of their departure from Malta, the illustrator has included a number of goats in the picture. Unfortunately for the Seaforths, and the other British troops in Crete, the presence of goats in both Malta and Crete had serious implications for their health. Mediterranean Fever (Brucellosis) transmitted from infected goats, was to prove, along with dysentery and malaria, one of the major sources of casualties amongst the British. The names of 187 British soldiers and sailors who died on Crete between 1897 and 1909 are listed on memorials in the Commonwealth War Graves cemetery at Suda Bay, Canea, and the churchyard of Agios Konstantinos, Iraklion. Of these, 17 were killed by ‘enemy action’ in rioting in Iraklion (Candia) on the 6th September 1898, four were drowned and the rest died of disease. These names do not include those who died in Malta and elsewhere of diseases caught in Crete, including one member of the 1/Highland Light Infantry who, according to the Dundee Advertiser of 29th December 1898, died as his ship sailed into Plymouth Sound on the return from Crete, but do include those who died in Crete of disease contracted before arriving in Crete. This entry was posted in British Army in Crete, European Intervention Crete, Seaforth Highlanders on August 30, 2014 by Mick McT. 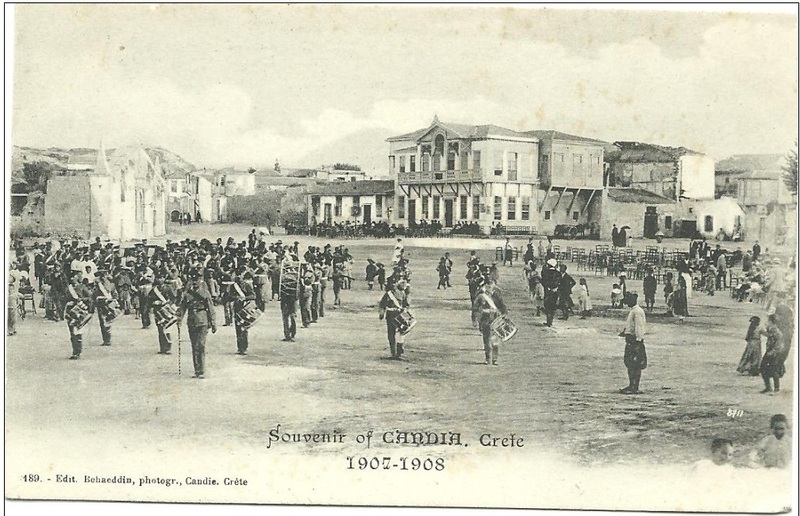 Upon landing in Crete in 1897, European troops occupied the major towns, leaving the interior to the Christian insurgents and their Greek allies. One problem that the Powers faced in both Canea and Candia (Iraklion) was the fact that the insurgents, in the unlikely event of them ever managing to unite under able military leaders, potentially had the ability to cut off the water supplies to the towns. This necessitated that the water sources be protected. In Canea the main spring supplying the town was guarded by the Ottoman fortress at the village now known as Perivolia – at the time the fortress was referred to as Fort Subachi (various different spellings) or Fort Butsunaria. Not only did the fort protect the spring, but it’s location, south west of Canea, meant that it blocked the route to the town that would need to be taken by the 1,500 strong Greek invasion force located at Aliakanos, should they attempt to capture Canea. The British contribution to the force consisted of a field gun detachment landed from H.M.S.Anson. Needless to say, while the PBI were stuck in tents, the officers had (slightly) better accommodation. The fortress no longer exists. This entry was posted in European Intervention Crete, Royal Navy in Crete and tagged Canea, Crete 1897, Fort Butsunaria, Fort Subachi, H.M.S. Anson, Royal Marines on August 17, 2014 by Mick McT. Evacuation of Greek troops June 1897. With Greece coming third in the 30 Days War against the Ottoman Empire (April – May 1897), part of the peace settlement terms imposed on both sides by the European Powers was the Greek renunciation of its supposed annexation of Crete and the withdrawal of all Greek troops and guns from the island. With an embargo on all Greek vessels preventing them from approaching the island, the Greek troops had to be ferried off to the waiting transports by European naval forces. 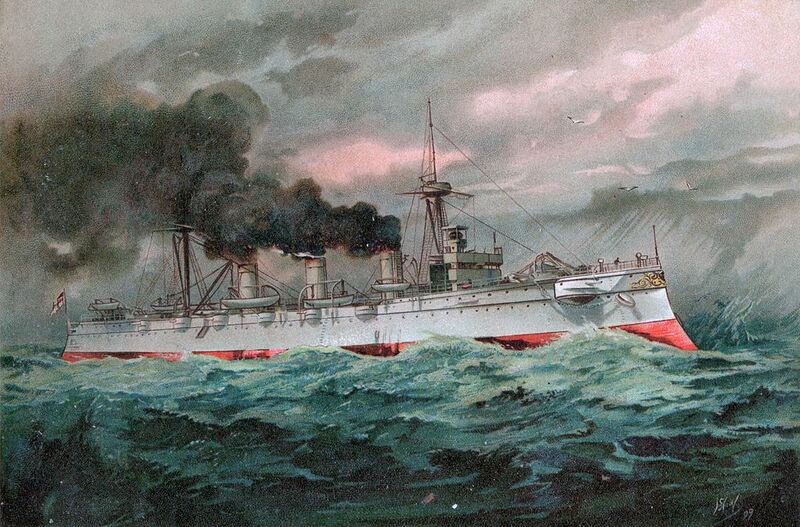 According to British sources this was carried out by the Royal Navy, men from H. M. S. Hawke in particular, but as the above from the French magazine L’Illustration of June 1897 shows, both Russian and French seamen also participated in the exercise. 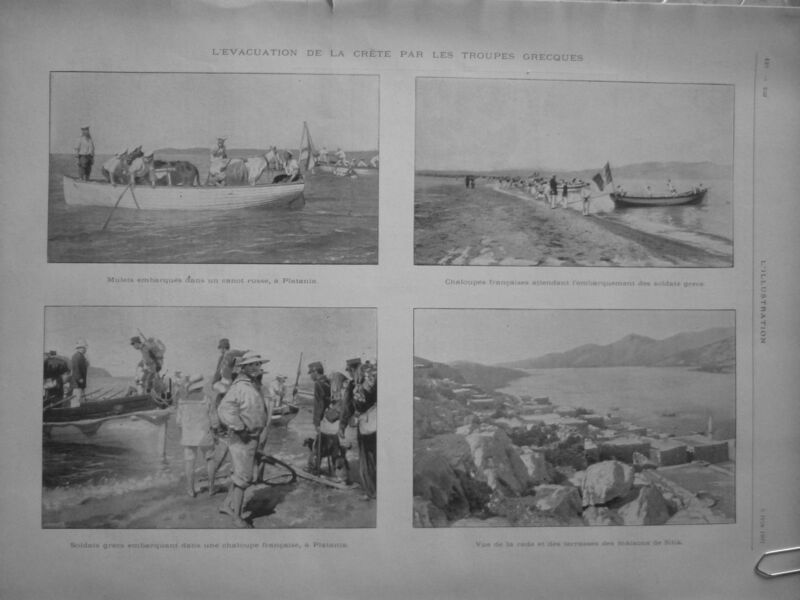 Ottoman troops en route to Suda bay. November 1898. 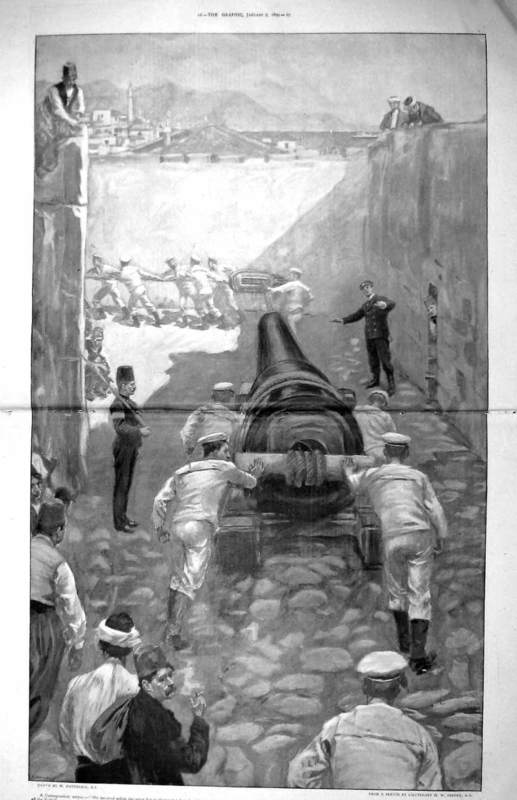 The removal of Ottoman guns from Candia. 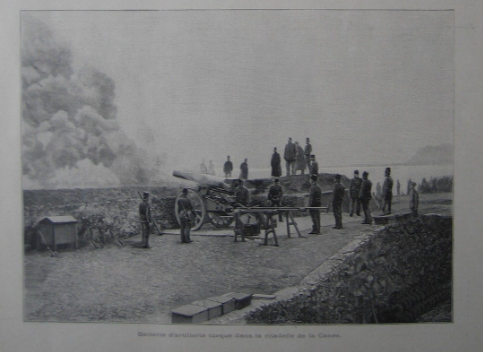 In theory all Ottoman troops and Officials were evicted from the island by 6th November 1898, but in practice there were still a small number of artillery specialists overseeing the removal of Ottoman ordinance as late as December that year. *Virtually no action was taken concerning the murder of some 400 or so Cretan Christians on the same occasion. This entry was posted in European Intervention Crete, Ottomans in Crete, Royal Navy in Crete and tagged 30 Day War, Ottoman evacuation on August 9, 2014 by Mick McT. 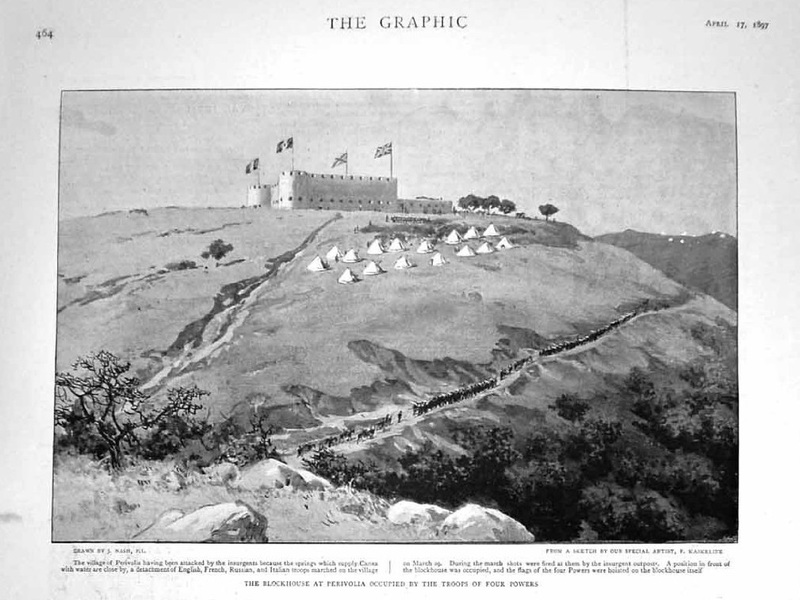 Shortly after British troops arrived in Crete in March 1897, Cretan Christians attempted to take over the Ottoman fortress covering the entrance to Suda Bay, Fort Izzedin. The fort was important to the Europeans because of the threat its modern guns offered to the European Fleets anchored in the Bay. Ottoman gunnery practice, Fort Izzedin, prior to the European Intervention. The Christians were driven off with the aid of gunfire from the European fleet and to prevent a recurrence, the fort was taken over by a mixed European force under the command of Colonel Bor, Royal Marine Artillery. 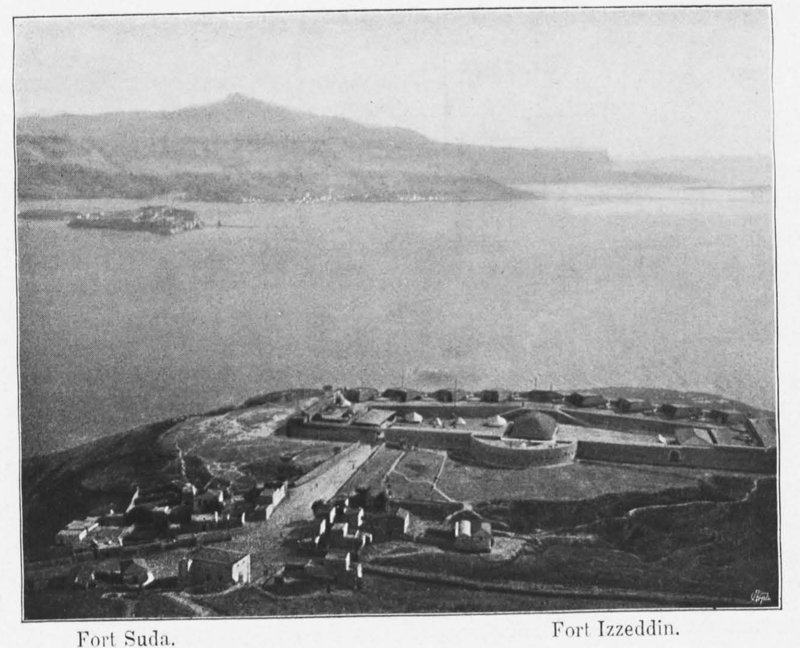 European Officers and troops in Fort Izzedin. The presence of Ottoman troops dates the photo to sometime prior to November 1898. 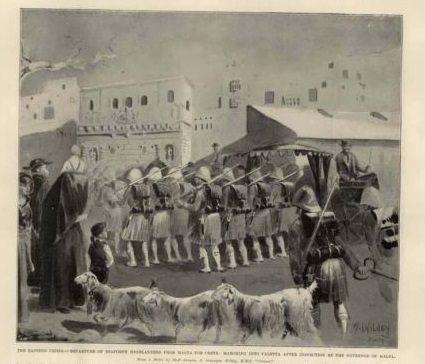 Bor had been sent to Crete in 1896 to take charge of reorganised Ottoman gendarmerie but the reorganisation proved a failure when the gendarmes, not having been paid for 18 months, mutinied and shot their Ottoman commander. On being put in charge of Izzedin, Bor was given the honorary rank of Colonel, his substantive rank being Major. 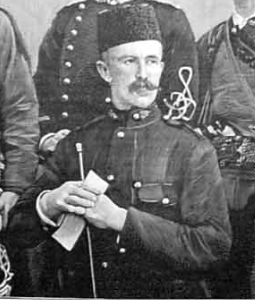 Major Bor, 1896, in the uniform of the Ottoman Gendarmerie. This entry was posted in European Intervention Crete, Ottomans in Crete and tagged European Intervention Crete, Fort Izzedin, Ottomans in Crete, Royal Marines on August 8, 2014 by Mick McT. German Marines in Suda Bay. Allied to the British and other European forces in the Intervention, German marines arrived in Crete 21 February 1897 on the protected cruiser S.M.S. Kaiserin Augusta. 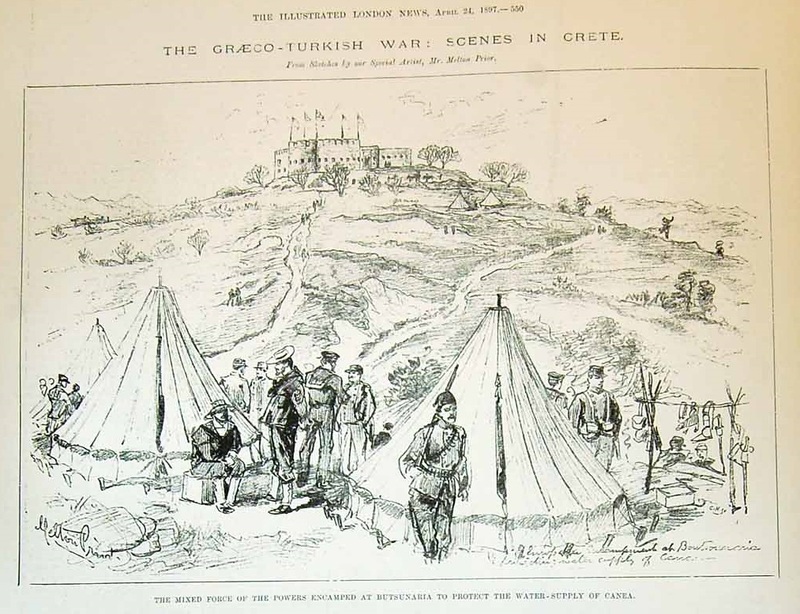 German troops remained in Crete until November 1897 when Germany, drawing ever closer to the Ottoman Empire, withdrew form the Cretan Concert. 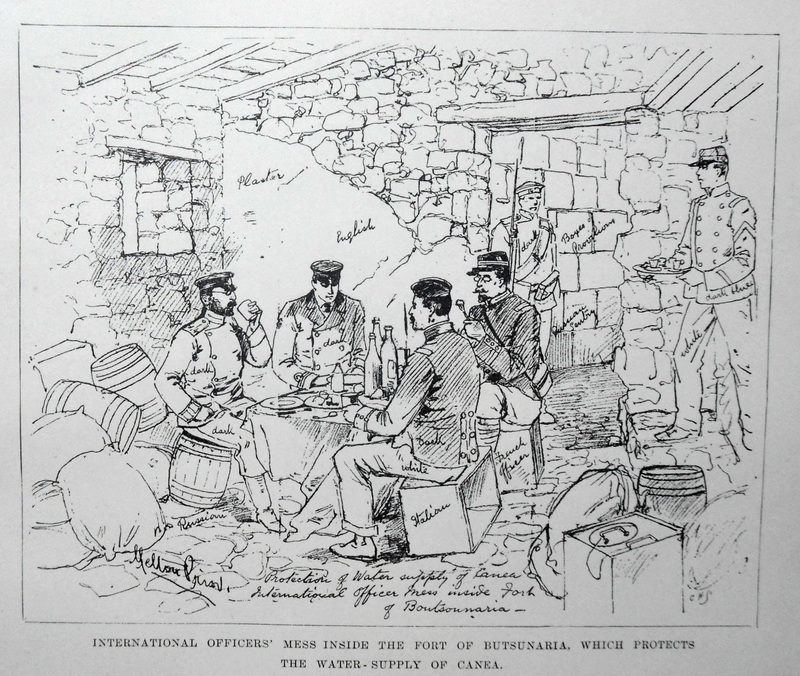 This entry was posted in European Intervention Crete, German troops and tagged Crete 1897, European Intervention Crete, German troops, Kaiserin Augusta on August 2, 2014 by Mick McT.